LOL, this is sort of "I did it just to do it" sort of paintings, not one of those I especially love! But I went to art class last night and was feeling blah and uninspired. I've been doing a lot of landscapes from photo references I've taken lately, and I enjoy that - but was also feeling an urge to do something from life, though no special idea of what. 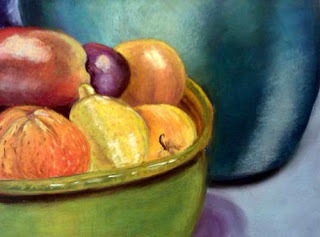 But as I set up my easel I saw Christina had various objects sitting on the ledge running along one side of the room, one being a bowl filled with fake fruit, and behind it a bowl containing a plant of some sort. It was not a formal still life setup by any means. But it was right there in front of me, so for fun I decided to incorporate the two into a picture, and this is what I did, on my usual 9x12 Art Spectrum. Not so exciting a picture, but it was fun to do.